Monitoring of remote networks is challenging task because you need full access to the network resources that should be monitored but it makes your network less secure. Secure alternative is to use monitoring agents. Remote Network Agent (RNA) in IPHost Network Monitor is a program that should be installed on a Windows server or workstation located in remote network. Remote Network Agent allows you to monitor servers (hosts) in hundreds of separate networks from one central point. With Remote Network Agent you can monitor all types of monitors available in IPHost Network Monitor (SNMP, WMI, HTTP, Oracle, PING and many more). RNA accepts commands from main IPHost Network Monitor installation, checks availability and performance of monitored resources and returns results back. Data transfer between IPHost Network Monitor and Remote Network Agent is secured with SSL. The first data exchange between central monitoring service and agent is also protected by Connection ID key. To comply with your company’s security policies we provide active and passive agents, active agent connects with central monitoring server by itself so no need to open any port on agent computer to accept inbound connections, passive agents are used if you need to secure central monitoring server. Network discovery of hosts and services in remote network via Remote Network Agent facilitates monitoring configuration setup. Upgrade of RNAs can be performed from central IPHost Network Monitor installation. 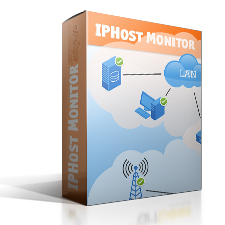 Alerting system of IPHost Network Monitor is extensive and flexible. It includes support of alerting by email, SMS over GSM modem/phone or email, instant messengers (Jabber, ICQ, AOL), audible and visual alerts, also system can be set to execute program or run script over SSH, or manage network equipment using SNMP SET command. Sending of all alerts is handled by main IPHost Network Monitor installations. “Script over SSH” alert is executed on target computer.